You’re on Facebook for the brands, right? 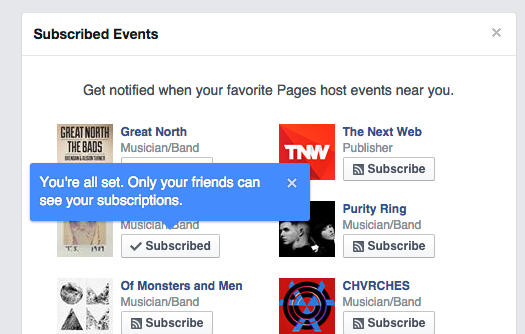 A new button allows you to get notifications whenever your favorite brand/musician/page is hosting an event near you, so that you don’t miss out. A new section shown in the events dashboard allows you to subscribe to pages to receive notifications when there’s an event hosted by the page near your location. The notifications appear in a similar way to what you’d see if a friend invited you to an event. According to Techcrunch, a new button will also appear on pages near the like button to encourage users to sign up for these notifications. The new button is in addition to the new ‘call to action’ buttons for Pages that the company announced earlier this year. It appears that the change is enabled for all Pages and that owners don’t need to perform any actions to get it.